It has been great being a blogger advocate these past few months for Petcurean. If you missed our previous posts, I suggest you take a peek at what a wonderful pet food company Petcurean is. But today I wanted to share with you what makes Petcurean different from economy brands. One of things I wish I could do is steer you away from buying kibble from the grocery store. I’m sure you know how grocery stores are set up, all the fresh and healthy items are placed along the walls of the store with all the processed foods being in the center aisles of the store. But normally when you enter a specialty pet retailer guess what? More often than not you’ll find premium quality Petcurean along the walls. I’m sure you would love to know why there is a difference. If you are looking for a company who cares about where their ingredients come from than Petcurean is your answer. With a trusted network of farmers, ranchers and producers, the are able to create recipes to accommodate a wide range of dietary needs. From recipes that are completely grain-free to those with grains, recipes to address dietary sensitivities and specific nutritional needs and much more. With a trusted network of farmers, ranchers and producers recipes are created using only premium meat proteins, fruits, vegetables, grains & cereals. You will never find ingredients sourced from China, nor will you ever find by-product meals or un-named meat meals. In addition, every batch of food is tested for salmonella. Since 1999 this Canadian-owned and operated family business has strived to create and develop the best food possible. This isn’t some corporate conglomerate, nope, this is a family that cares not only to give their pets the best food possible but yours too. If you have ever feed economy brand food then you know how much poop you are picking up on a daily basis. Now when you start feeding premium quality Petcurean things will begin to change. Why do you ask? 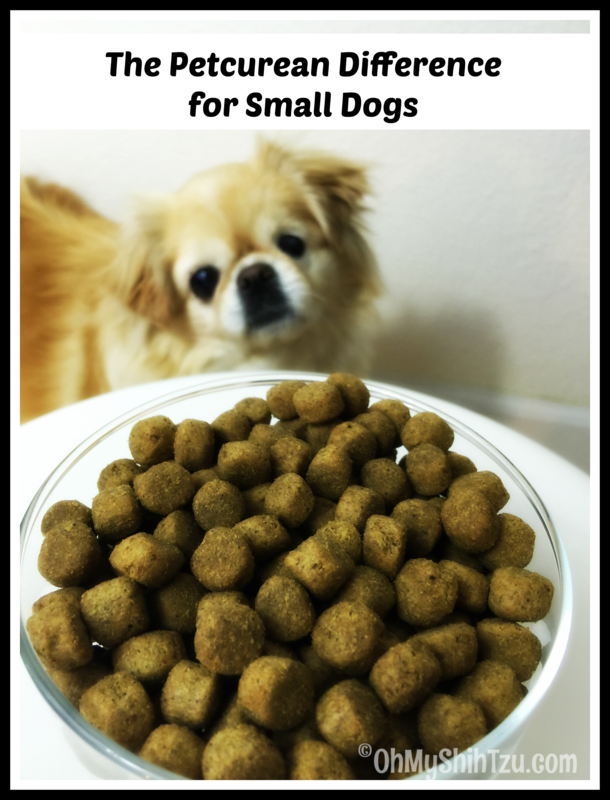 Simply when you create a quality food that contains premium ingredients you feed less because each piece of kibble is jammed packed with quality nutrition. When there is quality nutrition being provided much more of the food is being absorbed which results in less waste! Are you curious about Petcurean? Why don’t you try out a bag for your self! Just go to this link: FREE 1/2 POUND TRIAL BAG of NOW FRESH™ or GO!™ fill out the form and submit for a coupon for a free trial bag at your local specialty retailer. 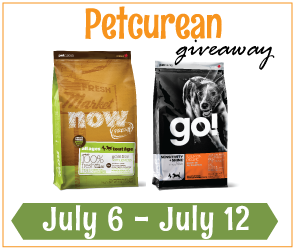 Don’t forget to visit us next Sunday, July 5th as we kick off the week with a Petcurean Giveaway!! Disclaimer: Petcurean is providing food for Riley and the girls as we are blogger advocates for Petcurean. Petcurean also has generously donated $500 worth Petcurean Dog Food to Animal Compassion Team of California (ACT) in the name of OhMyShihTzu.com . ACT is the wonderful no-kill rescue that started us off with our first Shih Tzu Katie! But please know that we only share what we believe is good for your pet, and a brand you can trust. We believe in honest and truthful reviews to protect you and your family. We are happy to be joining Tasty Tuesday hosted by Kol’s Notes and Sugar the Golden Retriever! Paying for better quality food saves money is so many ways…you need less of it, have a healthier dog, and there is less poop to clean! Great post. Glad you have had success with this food. Thanks! I applied for the coupon. I’ve recently switched Gadget to THK, but am looking for a replacement for Chewy’s food.